Christin is a metaphysical author and professional tarot expert with almost 30 years of experience in the field. Many people have a lot of misconceptions about Tarot, including what it actually is and how it can benefit everyone. Even those who don't subscribe to “fortune telling” and “divination” can use Tarot and its symbolism for more personal understanding and inspiration. I personally do not and have never believed a pack of cards has the ability to tell anyone what will happen to them in the future. That is fortune telling nonsense and unfortunately many people buy into this myth. Tarot is a great tool for critical thinking and multifaceted contemplation. When you see the visuals on the cards, the stories they present relate to real-life situations, feelings, and possibilities. Looking at a card layout and comparing it to what is going on in your life can give greater understanding, and help you look at things in creative new ways your mind may not have been open to previously. I have taken this approach to Tarot for the past 23 years and I've been teaching it on various websites. I believe that it is an amazing self-discovery and personal growth tool when it is approached with an open mind and without superstitious nonsense. I recognize my view isn't always popular. There are many who claim they can “foretell the future” with Tarot cards—and in many instances you absolutely can! My argument is that it isn't the cards telling your future, it is your own expanded mind, consciousness, and awareness that develops from using the cards over time. If you sit down with a deck of cards, ask what is going to happen to you in the future, pull several, and start reading a book of vague definitions you are going to be more confused than you were in the first place. This is a disempowered view of how to use Tarot, and frankly, how to approach your life. If you want a magic tool to give you easy answers, you are missing the point. So, if Tarot doesn't give me the answers what's the point? The point is to use the imagery to tap into intuitive, creative thinking. Many of us think analytically about everything. This isn't bad, it's how we get through daily life. When approaching problems we tend to just go “Google it” to get an answer. When we get into the complexities of life though, we need to seek answers that are more multifaceted and comprehensive. This is where we have to think critically, but also intuitively and creatively. This is where we really stretch our human capacity for thought, wisdom, and understanding. Learning Tarot as an art form requires effort. It is not an analytical process where you simply memorize a bunch of definitions and then off you go. Tarot books are sold by the hundreds of thousands—each proclaiming the “fastest, easiest” way to learn to read cards etc. This is all marketing hype. 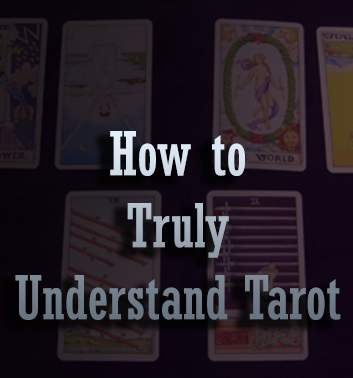 If you truly want to learn to read Tarot then you have to teach yourself. No two people will see the same things in a work of art. If you and a friend look at a photograph or painting, you may share some obvious conclusions that are similar, but each of you will have slight variances in your interpretations. The image may invoke different thoughts, ideas, and feelings in each of you. That is as it should be, we are all individuals with different perceptions. Mistakes are made in Tarot by newbies assuming that their interpretations must be “wrong” because an “expert” who has written books on the subject will obviously know more. This is a fallacy that causes a lot of people to struggle to learn a tool that could be very beneficial to them. First, is a basic misunderstanding of what it is and how it works, second is the belief that you need someone outside of yourself to tell you what to think. I love the Radiant Tarot. It is the same as the Rider-Waite (the most famous traditional Tarot deck), but it has more vivid colors and just "grabs" me more than a standard Rider deck. Many beginners to Tarot like to choose decks closely related to the original Rider deck because there is a lot more information published on these decks. That can be advantageous, but pick one that speaks to you. Find a deck you love, one that really speaks to you. There are hundreds of decks with many different styles of artwork. Find one you love that really draws you in and buy that deck. Next, buy a notebook or journal. 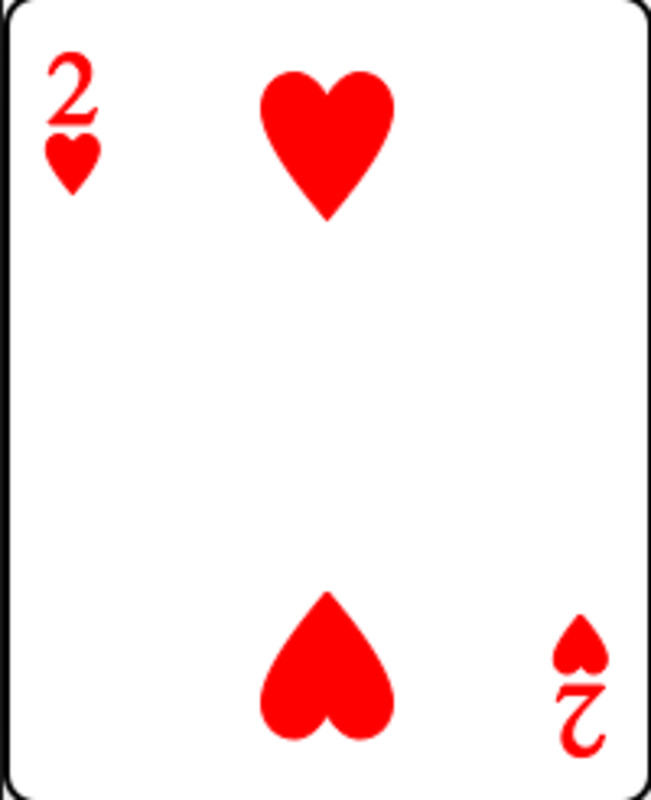 Each day, take a card from your pack and look at it for several minutes. Write in your journal what the card is, your immediate reactions, what you see first, and how it makes you feel. What is the story being told by the image? Write the story down in meticulous detail. You can do a few per day, but no more than three or you start to blend and confuse the interpretations in your mind. Don't use the book that comes with the deck until AFTER you have done your journal for that card. The goal is to tap into what this card means to you, not the creator of the deck. After you have gone through the entire deck, do it again. This time add anything you missed to your pages, any new insights, feelings, or wisdom. Continue this process until you've gone through your entire deck twice. If you stick this out and really work through it, you will find you are naturally able to be an amazing Tarot reader. Why? Because you will have a detailed, highly personal connection with the cards that triggers your own creative and intuitive thought processes. After that, you can begin to look at questions that are specific, and see with more well-rounded thought processes. One of my favorite cards in a standard Waite deck is the Sun. I love the happy feeling and the symbolism. 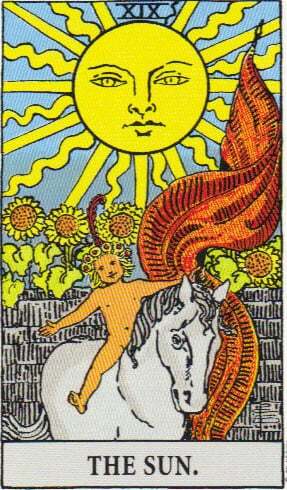 As you can see, in this card a brand new baby is riding on a horse beneath the blazing sun. The first thing I notice is the naked baby. Babies represent new potential, nothing tainted; this child has not been corrupted by things like doubt, anger, guilt, etc. The horse represents a journey, moving, and strength. The Sun itself is warmth, a source of energy and sustenance. It is deeply penetrating and is always there sustaining life even when we aren't paying attention. When night falls, the sun is still there and will return again. When we look at the sun in the sky it seems small like that baby. In truth however, the sun is a massive power source responsible for sustaining all of life. We also tend to view our own power as small, and in my mind the Sun is a reminder that we are all in control of our own destiny. We decide, based on the actions we take, what happens in our life. The baby reminds us to be open to new opportunities for growth, to keep moving in new directions, and to not be afraid to be ourselves. Babies are free to just be, they don't concern themselves with the judgments of others, they just are who they are. So let's say hypothetically I am seeking some advice about my business. Perhaps I ask something like “What do I need to do to make my business the most successful?” I draw the Sun card. I reflect a bit on the meaning of that card that I shared above. This card would be telling me that I need to take a chance, be willing to put myself out there, and that I need to put a lot of good, strong energy into my venture to guarantee its success. In this card I see potential (the baby), a need for hard work, and forward motion (the horse), and a need to see that my ideas are stronger than perhaps I gave them credit for (the sun). If the Sun were drawn reversed, perhaps it might be telling me that I am putting too much energy into something that doesn't really have the best potential at this particular moment. Don't give up, but understand that the timing is not right just now; the sun will always return another day, but for now direct my energy in a different way. See, it didn't tell me what “IS” going to happen—that is based solely on my will, determination, thoughts, beliefs, and actions. What it did reveal are some important lessons and things I need to do to help ensure my success. As I contemplate the symbolism and lessons of the card and how they correspond to my current circumstances, it opens the floodgates of the mind. It initiates more complex thinking—it draws in creative, multifaceted thought processes and helps me explore all the options. Keep in mind, this is also a single card. Most readings are more complex and detailed—looking at different variables like potential challenges, where things appear to be headed at present, longer range potential, others involved, etc. There are as many different spreads as there are decks and you can create your own custom spreads too—but that's a different article! Can I Ask for a Free Tarot Reading? Tarot Hermit with the Tarot Devil, are you Dancing with them? Tarot isn't for communicating with the other side. Ma’am from so many days I didn’t get a clear view on yes/no spread this article really make things so clear.Thank you so much for sharing your knowledge with us! Good to know there are others out there who practice the same philosophy Androste. I appreciate the read and comment. Wow, when I started reading your article I thought I wrote it. Your philosophy on Tarot is exactly what I have been telling and teaching people for years. I believe that's what this style does teach to let the cards tell a story instead of trying to "force it" and that's exactly what I like about it :) thanks for the read, comment and sharing your experiences. hi, i like the article and I do also think that if you take the time to observe the cards they would speak to you... I like large spread, the gypsy spread being my favorite. I like to breathe and relax in front of the cards... After a while i forget about the specific patterns and I just start to see stories, ideas and specially possibilities. What a wonderful word, the posibilities of seeing my situation in a different light... Love it! Thank you Sandy - well said. I appreciate the read and comment. I couldn't agree more. Cards will only tell you how things might develop if things keep going on as they are. You have a handful of options to change your destiny, and an piece of advice from a Tarot reader is, in fact, of great help if you take it as a PERSONAL STUDY of facts in your life. I really appreciate this information, it is an interesting point of view, we are the owners of our fates and no one can decide for us. WE CHOOSE. Lala, I've had a successful Tarot site and have taught tarot for many years. I said I don't believe in "fortune telling" which is not the same as a legitimate Tarot reading. Perhaps try reading and comprehending what you are reading before insulting people and finding something to be offended by. If you are "infuriated" so easily by reading only the first paragraph of an article, that is very telling and it suggests you did not take it context and did not read the full piece before getting offended. Tarot cards cannot tell you what WILL happen to you in the future. They can lend insight into the direction things are going, but YOU determine your own fate. If you would have read the whole hub before jumping to conclusions and being rude to me you would have seen that. Thanks Jim, I appreciate the read and comment. 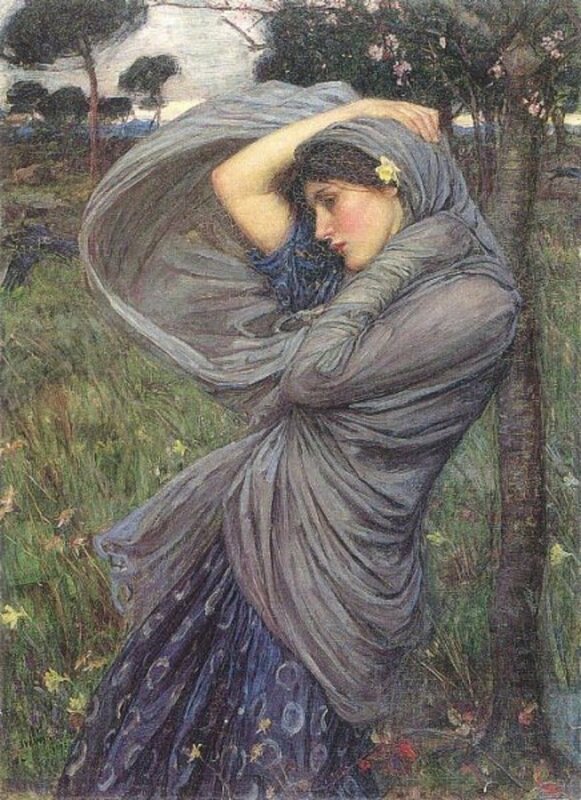 I've been using Tarot for over 25 years also and I've learned a lot more by letting the stories "speak to me". I've been reading cards now for 25 years and I thought this was a very thoughtful insightful piece that shows a very useful approach to the cards. When I read I look at the story the cards are telling. How do they help me better understand the situation or matter at hand? How do the cards relate to each other? What should I focus on or be attentive to in the future? Nicely explained. Very interesting! This reminds me of some things I read about tarot myself in an article somewhere forgotten on the internet, that made the point that tarot doesn't "tell the future" but rather it gives suggestions and ideas. I also like how you gave fourth the idea of being analytical with the cards - rather than giving out specific definitions. Makes me want to get into my own set of tarot cards and try it out. Speaking of Tarot, I'm not sure if you're much of a gamer but you ever hear of the Magical Drop series? It's a cute little puzzle game from Japan where all the characters are Tarot cards - so you have Death, Sun, Strength, The World, etc. Reading about Tarot reminded me of Magical Drop. I have come to know the cards in the same manner you have - additional perspective for any situation. I like to take one at a time with me throughout the day to see where they fit in to actual situations I encounter. I think additional perspective is more valuable than gold - once you have something else to compare to, options and solutions are revealed that were hidden before. I used to read online, did very well with it too, but got tired of the drama people would kick up after a reading and also carrying the situations of cyberpeople with me throughout my actual day... now I just read for friends here at home. I'm a bit relieved to meet a like-minded person on HP... was starting to think there might not be any lol! My sister in law has a great gift with Tarot. Last halloween she did a reading for me. I was having trouble at work and the Tarot immediately picked up on that and said I was the subject of bullying and gossip. The card which spoke of gossip actually had a picture on it of the girl who I suspected of doing most of the gossiping! It also said I would overcome this problem, and this year has seen a remarkable turnaround at work! Great information. I love Tarot and have really learned so much about myself through its use. I agree with your approach and share your feelings about Tarot, I don't really think it will predict the future per say, it just helps clarify what you may be overlooking or are too close to a situation to understand and/or see clearly at that time. I believe in that clarity, it then helps you to develop the outcome of a situation, either by changing something due to the clarity or nothing at all and let whatever will be will be. It has really helped me get focus and clarity on situations numerous times. Thanks for this informative Hub. I really enjoyed it. @ChristinS thanks for the great information and for going into details about tarot cards and understanding their meaning. Voted up and shared !